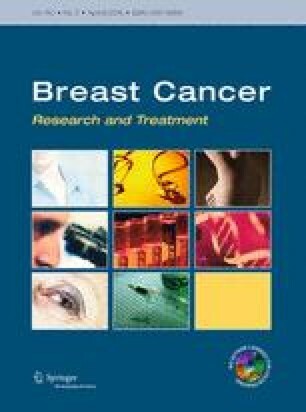 Taxane–anthracycline-based adjuvant chemotherapy is standard of care in patients with node-positive breast cancer (BC) but is also associated with severe side effects and significant costs. It is yet unclear, which biomarkers would predict benefit from taxanes and/or general chemoresistance. In this study, we investigate a large cohort of patients with intermediate-risk BC treated within the WSG EC-DOC Trial for the predictive impact of topoisomerase-II-alpha, HER2/neu, and TIMP-1. Tumor tissue was available in a representative cohort of 772 cases of the WSG EC-DOC Trial collective which compared 4xEC-4xDoc versus 6xCEF/CMF. In addition to hormone receptor status and Ki-67, HER2/neu+ and topoisomerase-II-alpha status using fluorescence in situ hybridisation (FISH) and immunohistochemistry, TIMP-1 using immunohistochemistry, and aneuploidy of chromosome 17 using FISH were evaluated and correlated with outcome and taxane benefit. There was significant superiority of EC-Doc over CEF regarding 5-year DFS (90 vs. 80 %, respectively, p = 0.006) particularly in patient subgroups defined by HR+, HER2/neu+, high proliferation (i.e., Ki-67 ≥ 20 %), patient age >50 years old and normal chromosome 17 status, high TIMP-1 and low topoisomerase-II-alpha protein expression. Significant prognostic factors in multivariate analysis were EC-Doc therapy (HR = 0.61; 95 %CI 0.38–0.986), age <50 years old (HR = 1.682; 95 %CI 1.025–2.579), centrally assessed grade 3 (HR = 4.657; 95 %CI 1.809–11.989), and high Ki-67 (HR = 2.232; 95 %CI 1.209–4.121). Interestingly, we observed a significant interaction between treatment arm (EC-Doc vs. CEF) and high topoisomerase-II-alpha protein expression (HR = 0.427; 95 %CI 0.203–0.900) in multivariate interaction analysis. Despite of univariate predictive effect of HER2/neu status among other factors only topoisomerase-II-alpha protein expression was associated with significant benefit from EC-Doc compared to CEF by multivariate interaction analysis. We thank Rudolf Jung for excellent technical assistance. We thank all the patients who took part in the trial and consented to provide their dataand all the investigators for treating the patients and reporting their data. We thank all pathologists who provided tumor blocks to our tumor bank. Our special thanks to D. Hofmann, D. Schindowski, I. Renner, C. Buehne, F. Werner, S. Martens, and K. Riedel for study management; G. Schuett, MD, for medical support. The present work was performed in fulfillment of the requirements for obtaining the degree “Dr. med.” at the Friedrich-Alexander.University Erlangen-Nuremberg (FAU).